NEW DELHI — India's ruling party and the main opposition are both supporting a protest blocking women from entering one of the world's largest Hindu pilgrimage sites, in what political observers said is a bid to court voters in the country's south ahead of a general election due next year. 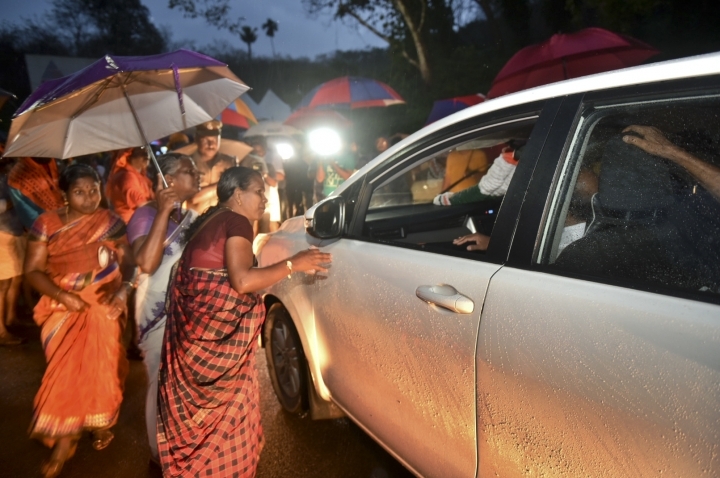 Busloads of Hindu women and girls traveled through the dense jungle of the Periyar Tiger Reserve in Kerala, India's southernmost state, to enter the hilltop Sabarimala temple that a Supreme Court ruling opened to them this week for the first time in centuries. 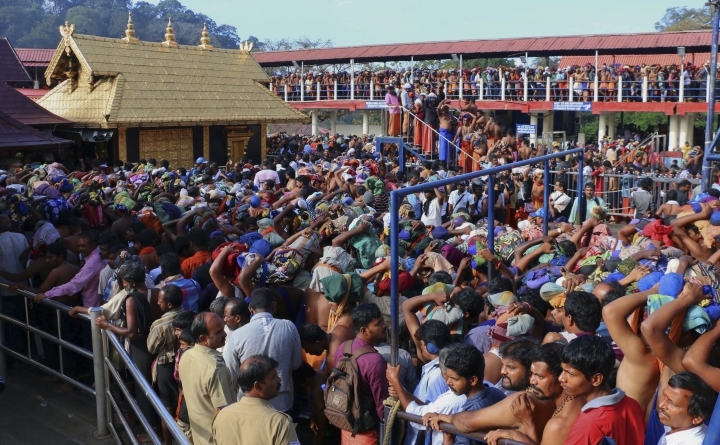 But throngs of male devotees defied the ruling, which found the temple's prohibition of women of menstruating age unconstitutional, demanding that females show proof of age before allowing them to enter. Men also attacked female reporters covering the confrontation, hitting and kicking them and smashing their vehicles. Protesters vowed to file a petition with the Supreme Court seeking a review of the ruling. They say the celibacy of the temple's presiding deity, Lord Ayyappa, is protected by India's Constitution, and that women of all ages can worship at other Hindu temples. Some Hindu figures consider menstruating women to be impure. 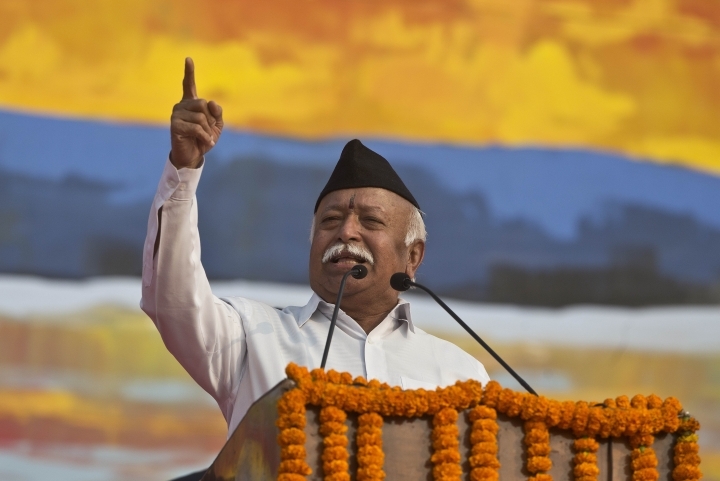 Mohan Bhagwat, chief of the Rashtriya Swayamsevak Sangh, a hard-line Hindu group that created the ruling Bharatiya Janata Party as its political arm, has sided with the protesters, saying the Supreme Court had ignored local tradition and beliefs. The "faith of millions of devotees was not taken into account," Bhagawat said during a Hindu festival in New Delhi on Thursday. Members of the opposition India National Congress party, which maintains a stronghold in Kerala, also voiced support for the protesters after first praising the Supreme Court's ruling. "There are sentiments that have been expressed by a multitude of groups in Kerala," Congress party spokesman Randeep Surjewala said. India Prime Minister Narendra Modi has described himself as a crusader for women's rights, citing his support for court verdicts banning triple talaq, a Muslim practice that allows men to instantly divorce, and imposing harsher penalties for rapists. But he has remained silent on the violence in Kerala, suggesting to some political observers that the BJP sees an opportunity in the temple controversy to reap electoral dividends. "The BJP wants to oust the Congress from the position that it holds in Kerala. It sees an opportunity," said political analyst Neerja Chaudhary. Modi's BJP has been trying desperately for years to gain a foothold in southern Indian states such as Kerala, Andhra Pradesh and Tamil Nadu, but the Congress party is determined not to lose ground there. Though the BJP is the presumed front-runner for next year's general election, it is not expected to repeat its performance in 2014 and win an outright majority, falling back on regional groups representing the tens of millions of temple devotees — and voters — in India's southern states. Kerala has been rocked by protests by the BJP, Congress and hard-line Hindu organizations objecting to the Community Party of India (Marxist) state government's decision not to file a petition for review with the Supreme Court. The BJP in Kerala led a massive five-day rally to press its demands. 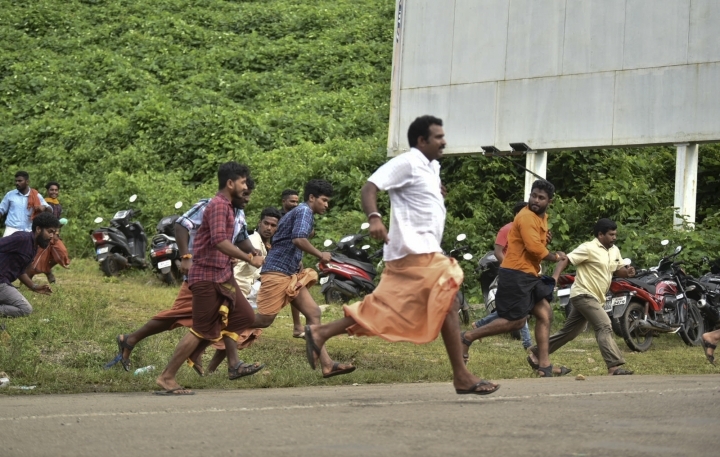 The Kerala government has responded by deploying more than 1,000 police officers in the temple's vicinity who used batons to try to break up the protesters blocking the hilly road leading to the temple complex. Protesters responded by throwing stones. Volunteers of Shiv Sena, a BJP ally, claimed to have readied a seven-member suicide squad it threatened to deploy to prevent females aged 10 to 50 from entering the temple. The temple showdown comes as Kerala's government continues an immense cleanup effort after the worst floods in more than a century killed more than 200 people and drove more than 800,000 into relief shelters in August.